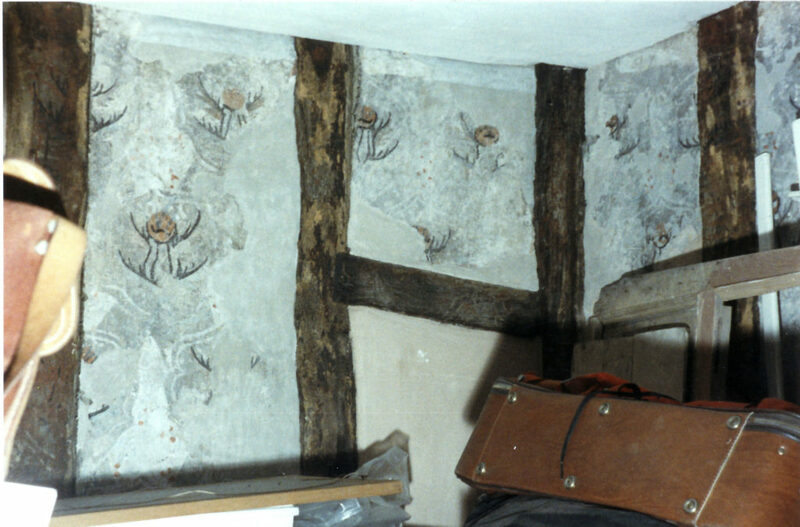 A restored section of a wall painting inside what is now number 53 Chipping Hill. There are three other sections like this one (M2, M3 and M4). Muriel Carrick wrote to me about all three that “they are very faded. Double banded interlocking medallions form repeated compartments for a foliated floral motif, perhaps a pomegranate bud, or it could be seen as the fruit itself. The fading does not allow for the lines above this object to be defined into a clear interpretation. Above this area again are little red dots, perhaps again fruits/berries or buds. The whole scheme is reminiscent of that found in contemporary Italian textiles, and is probably meant to represent a rich hanging such as the paintings at Campions in Sewards End, and at 19 Bradford Street, Bocking. Another painting in the house (M1) has three fishes (representing the Trinity) and the date 1606. In that year number 53 was owned by Christopher Greene or his daughter Sarah. Christopher died sometime between 1593 and 1608″.